MOSCOW, Russia (CNN) -- Russian and British ships repelled a pirate attack on a Danish ship in the Gulf of Aden, the Russian navy said Wednesday. 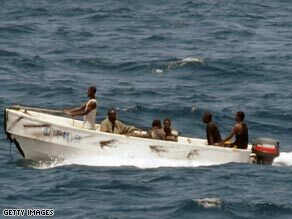 Pirates have caused havoc off the coast of Somalia, hijacking 33 ships this year. Elsewhere, pirates hijacked a Turkish-flagged ship carrying 4,500 tons of chemicals and 14 crew off Yemen's coast. The pirates hijacked the ship, Karagol, near Yemen as it traveled to Mumbai, India, semi-official news agency Anadolu Ajansi reported, citing a written statement from the Turkish Maritime Agency. Russian navy spokesman Igor Dygalo said the Russian patrol ship Neustrashimy and a British frigate, HMS Cumberland, successfully rebuffed pirate attempts to seize the Danish ship Powerful off Somalia. The British and Russians used helicopters to counter-attack the pirates, who had opened machine gun fire on Powerful and twice tried to seize it, Dygalo said. It was not immediately clear when the incident occurred. When asked about the incident, the British Ministry of Defense said a crew from the Cumberland had boarded a small boat on Tuesday that "they ... believe had been involved in an attack on the Danish-registered MV Powerful earlier in the day." Ahead of boarding the small boat, or dhow, the British crew members tried several ways to stop it, "but they were unsuccessful," the Ministry of Defense's statement said. The Cumberland then launched boats to circle the dhow, in another attempt to halt it. People aboard the dhow opened fire at these boats, and the Cumberland's crew members returned fire, the statement said. Two alleged pirates were killed during the shooting. A third person, a Yemeni national, died later from injuries, despite care from the Cumberland's doctor, the Ministry said. "It is unclear whether his injuries were as a result of the firefight or a previous incident." The Gulf of Aden, which connects the Red Sea and the Arabian Sea, has become a treacherous stretch for ships, particularly along the Somali coast. There have been 84 attacks and 33 successful hijackings off Somalia's coast this year. Meanwhile, the Karagol is owned by Istanbul-based Y.D.C. Denizcilik, A.S. The company confirmed its ship had been hijacked, but could not provide any details. The Karagol is the second Turkish ship in two weeks to be hijacked. On October 29, pirates in the same area off Yemen commandeered the Neslihan, a Turkish-owned freighter, carrying 77,000 tons of iron ore from from Canada to China, the ship's owner, Ya-Sa Shipping Industry and Trading, S.A., said. CNN's David McKenzie and Andrew Carey contributed to this report.